Home > News > It's Easy Being Green at Bookmans this April! Bookmans is associated with our iconic orange color, but at our core, we are green through and through! While you celebrate the gloriously long evenings, tackle spring cleaning, and adventure into everything outdoors, be sure to add these exciting and free Bookmans events into your April schedule and join us for some good, green fun! Earth Day comes once a year, but every day is a great day to think about how we can help protect and preserve our planet. 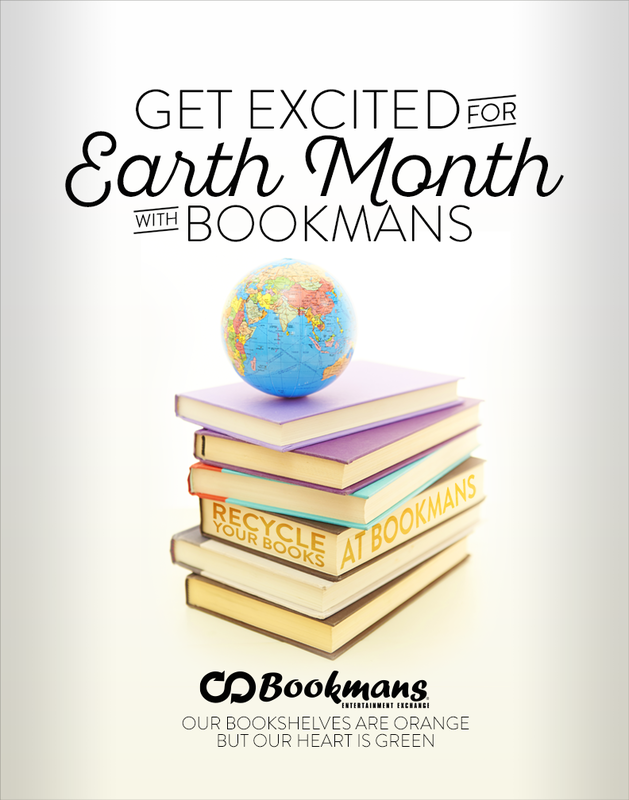 This month Bookmans has Earth Day events storewide, and we cannot wait to show you how green our heart is! First up is the Protect our Planet Earth Fair at Flagstaff where you can learn how to be a responsible Earth-dweller from local experts. Little ones will love the Earth Day Luminaries Kids Craft event at Bookmans Mesa where kids can decorate Earth centerpieces and discuss how important our planet is. Bookmans Northwest is here to help show kids how to plant and grow the gifts that give back to the world with a seed planting event. Who knows more about protecting the environment than The Lorax? Bookmans Flagstaff hosting a Lorax movie and craft time to learn all about why it’s important to keep our planet happy and safe. In Tucson, Bookmans East’s Earthfest Celebration workshops will show everyone how to “seed-to-table” benefits us all. Love to haul your books and groceries in reusable, responsible tote bags? Don’t miss the Earth Day Celebration at our Phoenix store where you can decorate your own tote, plant a tree, and make a funky natural necklace too! If you shop at Bookmans, you’re already a part of the green movement! Our stores are founded on the core value of recycling goods, and you are a part of that cycle. Trading your gently-used items at Bookmans keeps our world greener, and Bookmans trade credit is as green as our cash offers! Wait – there are even more events coming to a Bookmans near you! The Easter Bunny is coming to town and stopping by Bookmans Phoenix for the Easter EGGstravaganza! Use clues to decipher the locations of three eggs loaded with Easter goodies and get a pic with the Easter Bunny too. The Phoenix team will also be on hand at the Phoenix Film Festival. Be sure to come by the Bookmans booth on Kids’ Day at the festival. Bookmans Flagstaff wants to show the little ones how important earthworms are to our environment. With the help of the Willow Bend Environmental Education Center, the kids will love our Exploring LIVE Earthworms event. In Tucson, our Midtown store’s Free Video Game Tournaments are a hit every month, and you can sign up an hour in advance to reserve your spot! If you are ready to open your home to a whole lot of love, come to the Meet Your New Best Friend Adoption Day event at Bookmans East and meet some animals in need of a forever home like yours. Bookmans Northwest is hosting a Local Author Fair where you can meet and chat with Tucson-based authors and explore new literary works from fiction to children’s books. Heading to ZapCon? So are we! Bookmans Mesa will be at ZapCon and we cannot wait to see you at this epic pinball and arcade gaming event. Flagstaff’s local artists will be on hand to discuss all things art at the Artists’ Coalition Art Show Opening. You’re the coolest kid in town because you’re invited to the Bookmans Mesa Ukulele Party where you can learn how to play everyone’s mini instrument. More events are on the calendar this month, so be sure to check out our Bookmans event page for all of our fun and free April events! 20% Off Storewide Sale at Bookmans Flagstaff!